OTTAWA, Feb. 7, 2019 /CNW/ – While overvaluation has eased in Toronto and Victoria, Canada’s overall housing market remains vulnerable for the tenth quarter in a row, according to the most recent Housing Market Assessment (HMA)released by Canada Mortgage and Housing Corporation (CMHC). 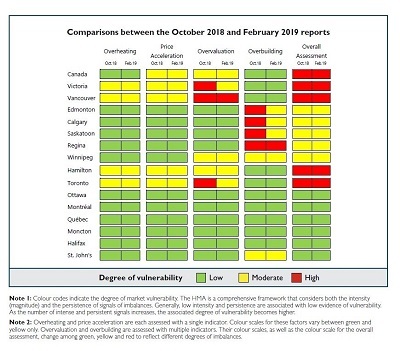 Saskatoon, Regina and Winnipeg all continued to show a moderate degree of overall vulnerability in their respective markets. In Saskatoon, the inventory of completed and unsold units has stayed below CMHC’s threshold over the past three quarters. Therefore, evidence of overbuilding has changed from high to moderate. In Regina, evidence of overbuilding remained high due to a high vacancy rate and elevated new housing inventory. Winnipegcontinues to see a moderate degree of overvaluation and overbuilding, and the overall assessment of the housing market is unchanged from the previous quarter. Assessments for Canada and all 15 CMAs can be found in the graph located in the release backgrounder. CMHC defines vulnerability as imbalances in the housing market. Imbalances occur when overbuilding, overvaluation, overheating and price acceleration – or combinations thereof – depart significantly from historical averages. To obtain an accurate picture of the overall state of the housing market, it is important to consider multiple data points and lines of evidence. The Housing Market Assessment (HMA) analytical framework provides a comprehensive and integrated view that relies on a combination of indicators to detect imbalances in housing markets for several metropolitan areas across Canada, and for Canada as a whole. Specifically, the HMA considers four main factors that may provide an early indication of vulnerability in the housing market: overheating, price acceleration, overvaluation and overbuilding. For each factor, the framework tests for the intensity (magnitude) and the persistence of signals. Generally, a situation in which we detect few signals with low intensity or lack of persistence is associated with a low degree of vulnerability. Conversely, as the number, intensity, and/or persistence of the signals increases, so does the evidence of imbalances in the housing market. Overheating and price acceleration are each assessed with a single indicator. Colour scales for these factors vary between green and yellow only. Overvaluation and overbuilding are assessed with multiple indicators. Their colour scales, as well as the colour scale for the overall assessment, change among green, yellow and red to reflect different degrees of imbalances. 1. Overheating: Sales greatly outpace new listings in the market for existing homes. Moderate: Sales-to-new listings ratio lies above the threshold of overheating for at least two quarters over the past three years. 2. Sustained acceleration in house prices: Fast-rising prices often indicate that expectations of future house-price appreciation may be excessive. Moderate: The Augmented Dickey-Fuller (ADF) test statistic stands above the critical threshold for at least one quarter during the past three years. 3. Overvaluation: House prices are higher than levels supported by personal disposable income, population, interest rates, and other fundamentals. High: The average of the gaps obtained from a group of selected models is above the critical threshold for at least two quarters during the past year. The gap measures the distance between the actual price and the price level estimated from fundamental variables of housing markets. Moderate: At least one of the selected models exhibits overvaluation. 4. Overbuilding: Inventory of newly built and unsold housing units and/or rental apartment vacancy rate are significantly above normal levels. High: The inventory of newly completed and unsold units is above the threshold for at least two quarters during the past year, while the annual rental apartment vacancy rate is also above the threshold. Moderate: Either the inventory of newly completed and unsold units is above the threshold for at least two quarters during the past year or the rental apartment vacancy rate is above the threshold. Low: None of the previous conditions is present. Overall assessment: Assess the degree of market vulnerability considering the combination of multiple factors. High: More than one factor of price acceleration, overvaluation or overbuilding exhibits moderate or strong evidence of imbalances. Moderate: The rating reflects three scenarios. The first is when the overall assessment is red in the past six quarters. The second is when only one of the factors of overbuilding or overvaluation is assessed red for at least two quarters during the past year. The last is when one factor is showing moderate evidence of imbalances, but another factor lies slightly below the threshold. The HMA takes into account demographic, economic and financial determinants of the housing market such as population, personal disposable income, and interest rates to detect vulnerability. The framework also takes into account recent developments in both resale and residential construction markets. The HMA was developed on the basis of its ability to detect vulnerable housing market conditions in historical data, such as the house price bubble Toronto experienced in the late 1980s and early 1990s. The ability of the HMA to detect vulnerabilities relies on the assumption that historical relationships between prices and fundamental drivers of housing markets have not changed.